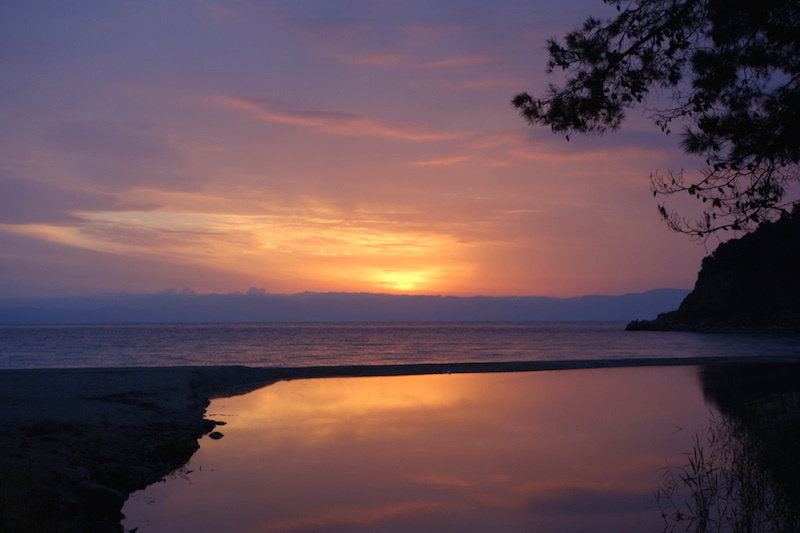 Our stay in Greece was fast coming to an end but because it was a tad cold still in central Europe (the next phase of our journey) we decided to hire a car and undertake a camping trip east of Thessaloniki to the Halkidiki region. Map showing our ten day camping trip (red line). The black dotted line shows our 1972/3 trip. When arranging the bike hire at Action Bike in Thessaloniki we asked Giorgos (part owner manager) if he knew of a reputable company from which we could hire a car. He suggested a company saying the owner was a client of his. A couple of telephone calls later and it was all arranged. On the day of the car pickup our friend Dimitris took us to the car hire company. It appeared to be a prosperous establishment, as well as having cars for hire there were cars for sale as well. I thought to myself ‘this mob is not short of bob’. Reflect back to the man we met at the yacht club, the one I said was ‘not short of a bob’ (previous post). You guessed it, the owner of the company was the same man. At the time when we spoke with him at the yacht club we had no idea we had arranged to hire a car from him. As a consequence we struck a very good deal. 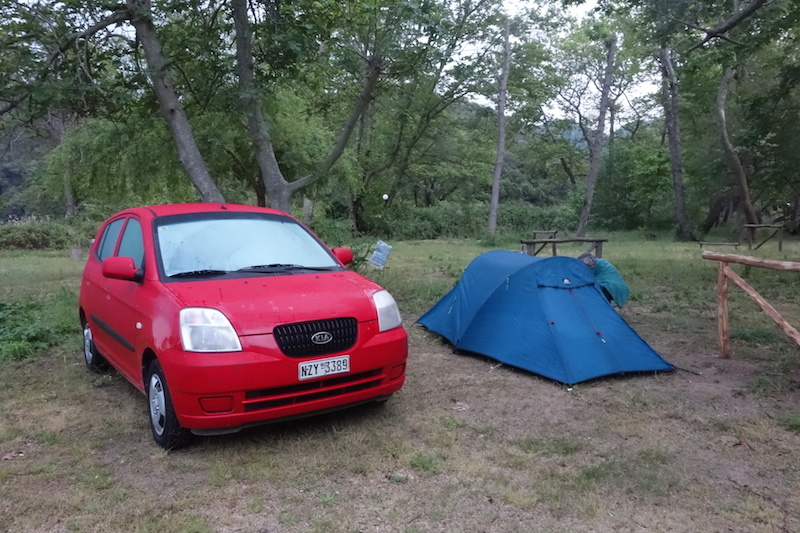 Our little red hire car and our first camp. The Haldikiki region resembles a hand. The Greeks refer to the three peninsulas as fingers. The three fingers are Kassandra, Sithonia and Athos. Following the advice of our friends we decided to spend most of our time exploring the centre finger, Sithonia. The eastern finger is out of bounds for the likes of us, only the religious of the male gender are allowed in. Our first camp near Nikiti was nothing exciting. It was really an area reserved for permanent caravans with no provision for tents. The ground was so hard we could only manage to get the pegs in about 50mm. The camping area was circa 1970 and it took us back to our 70s touring days. We were the only people there, as the ‘season’ didn’t officially begin until the 1st May. The only residents at the camping area were a few cats and the odd dog, always a worry, as often they seem intent on urinating on tents. 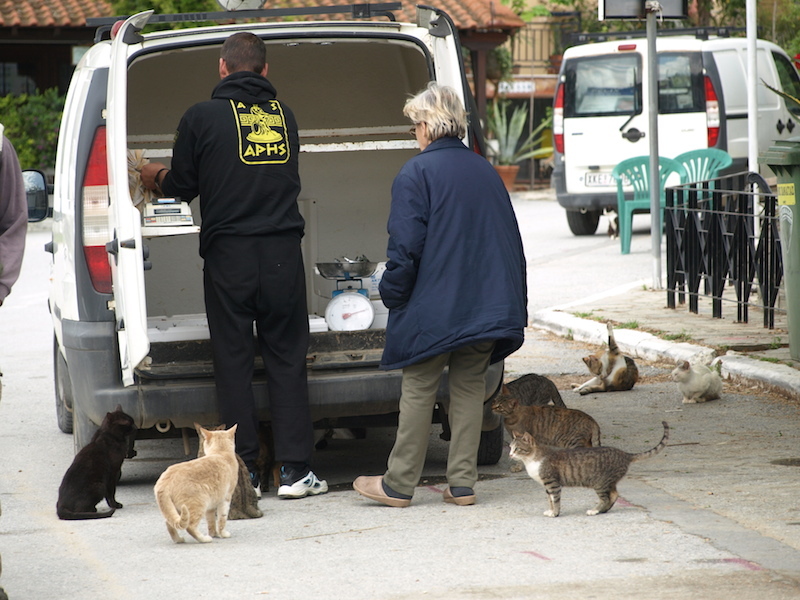 As I have mentioned previously, stray cats are a problem all over Greece. 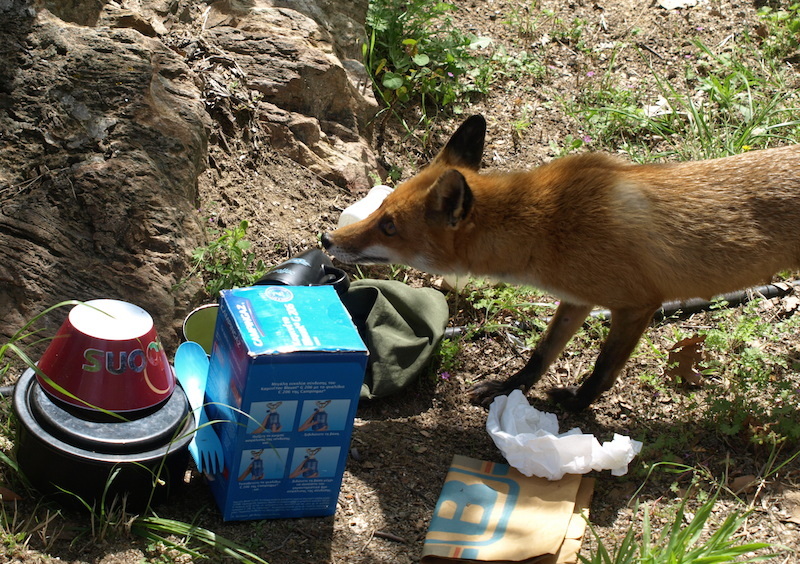 Not only do they want to establish their territory by letting a little go on tents but they also are a problem wherever there is food. The following photograph of a sign in an outdoor dining area of a café on the peninsula tells all. 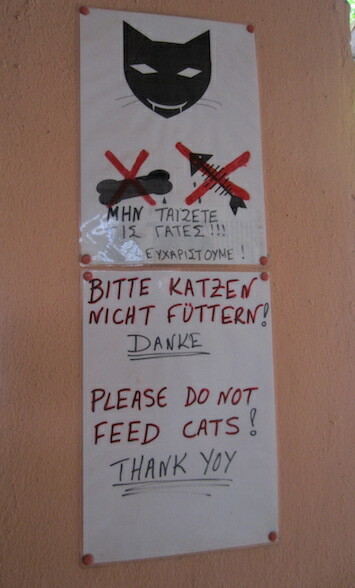 It was obvious the resident cafe cats couldn’t read as a number arrived at our table. Couldn’t blame them though as we ordered sardines and pomme frites. I said to the cats, ‘Can’t you read?’. Other diners laughed. 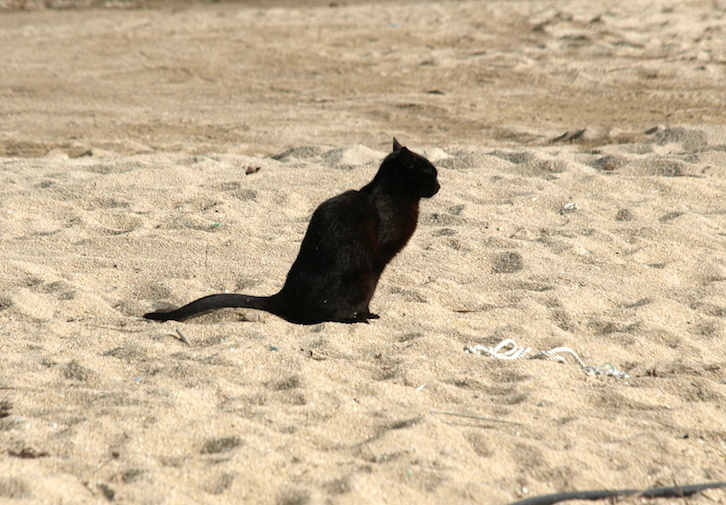 A cat on the job down on the beach nearby. It’s a hack putting your elbow into a cat latrine on a beach. The fish man calls and the strays line up. Our cooking and dining area under a caravan awning. We were grateful to the owners for the awning as it sheltered us from the rain. 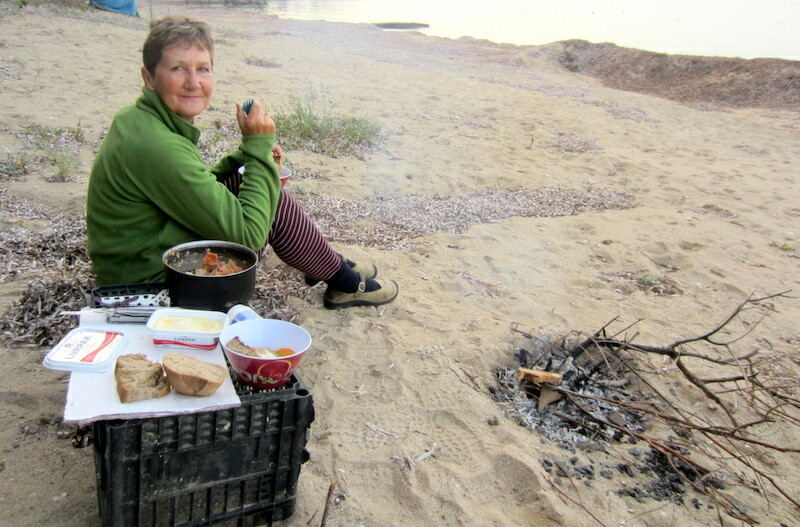 Breakfast on the beach with campfire, though not much decent wood around. Doesn’t Bev look happy with the prospect of a piece of toast, something we have not had in a while. The making of toast seems to be an English thing. People in European countries rarely eat toast, they prefer to simply eat bread. Bev thinks it’s something to do with the quality of the bread. In Australia the quality of commercial bread is pretty poor therefore you have to toast it to give it a bit of body. Soon after leaving the camp the day brightened and as we travelled south we realised why we were told to explore the centre finger: mountains plunged down into the sea forming picturesque bays and harbours. 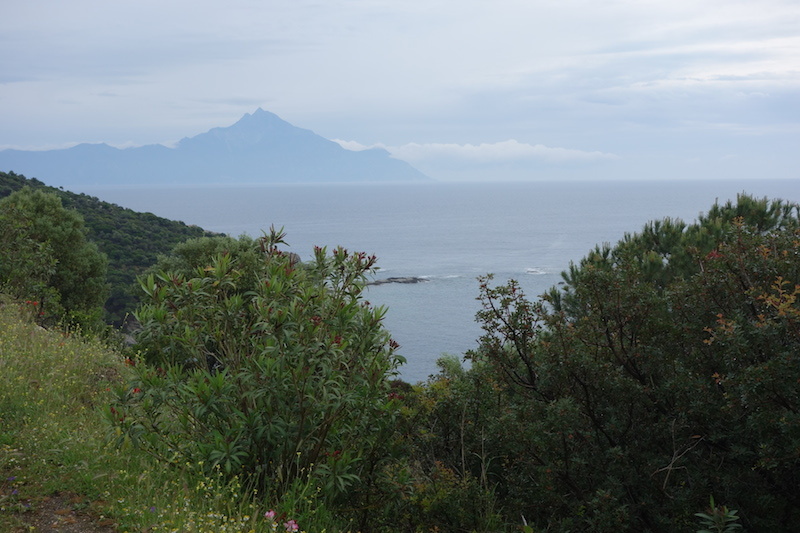 Mt Athos (2030m) in the distance on the most eastern finger. About midway down the peninsula we found a camping area open and used it as a base. At Camping LACARA everything was on offer. To our liking was the fact there were very few people about, the odd camper van came and went that was all. June, July and August are the main months for campers. Our camp site at Camping LACARA. 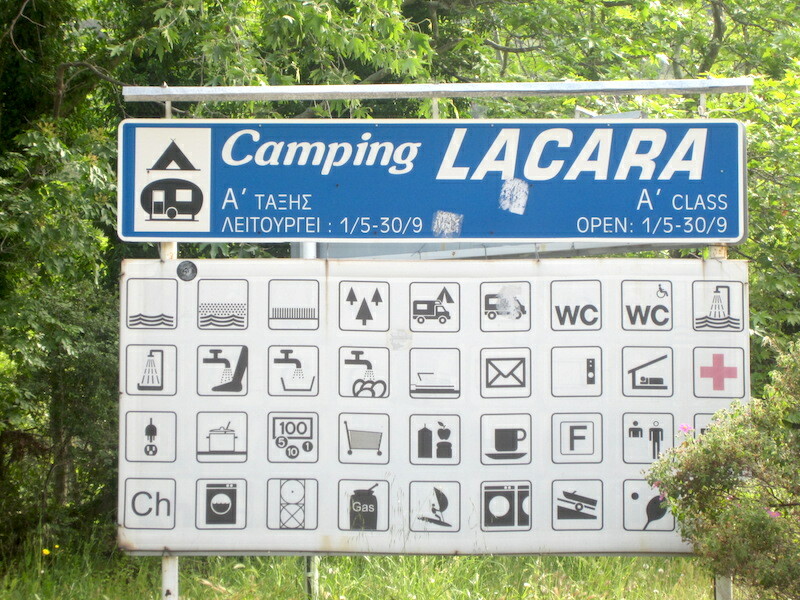 Camping LACARA site was good, so good we ended up staying four nights. The showers were adequate, there was a café within two hundred metres and, best of all, no cats wanting to urinate on our tent. 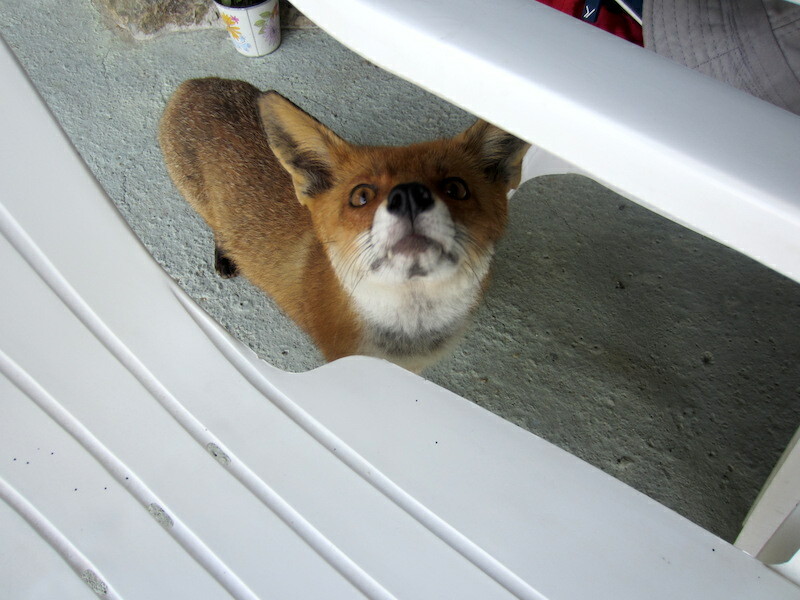 I think there were no cats because there was a resident fox. Mrs Fox checking out our kitchen. Mrs Fox even followed us to the café. 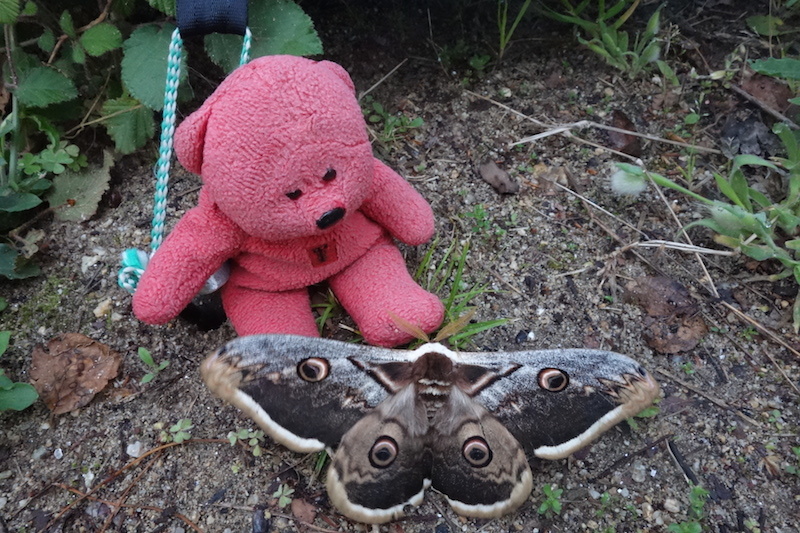 Tbear found a friend at the campsite. One of the Hawk moth family, approximately 100mm across the wings. Sunset from our tent site. 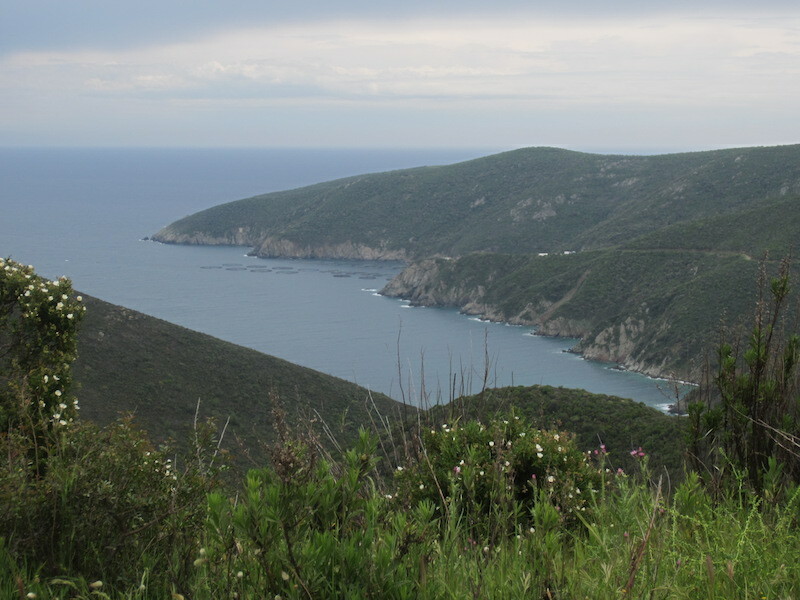 Looking across to the holy Mt Athos peninsula. Unfortunately it rained during our stay so we spent time in our tent reading, playing Scrabble and dozing, not all bad activities when it’s damp outside. Whilst at the camp we were invited for an evening meal with a young couple from Lucerne Switzerland and on another night we joined two Thessaloniki locals for a barbecue. They were setting up their caravans for the coming summer holidays. 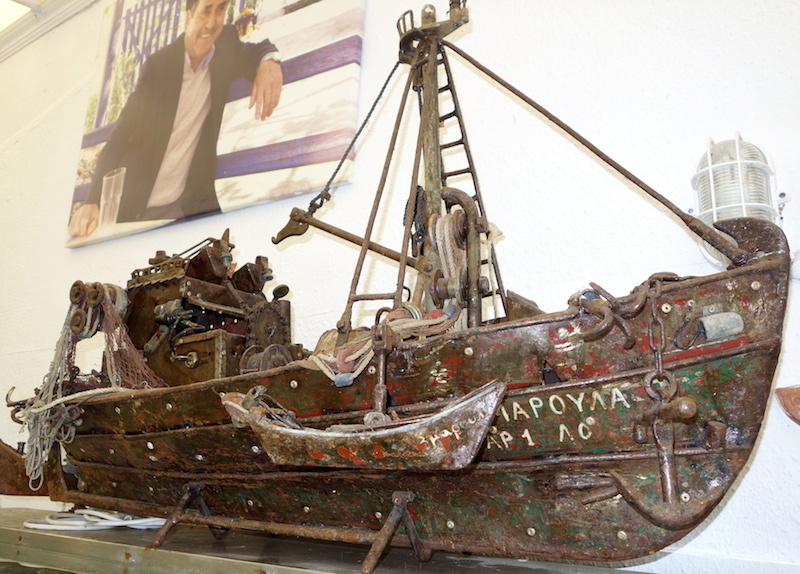 The three fingers including the Sithonia peninsula extend into the Aegean Sea and wherever the sea laps the shore there are boats, particularly fishing boats. 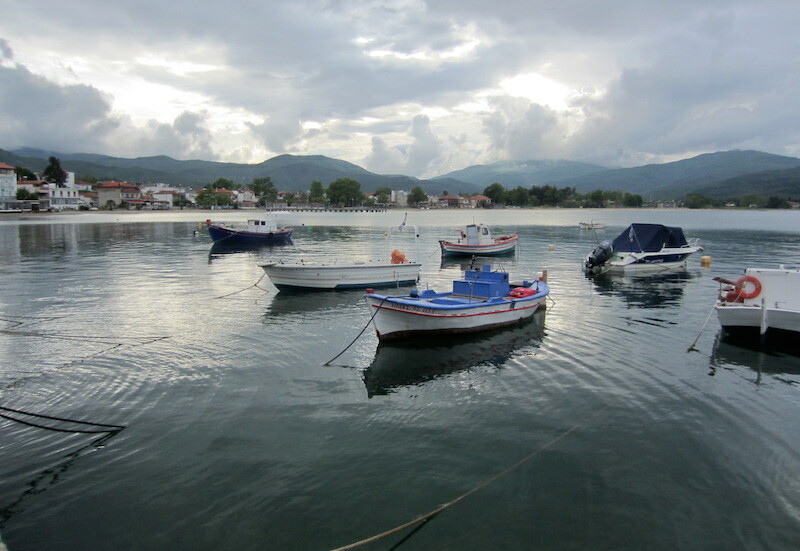 Fishing is very much part of the Greek psyche. 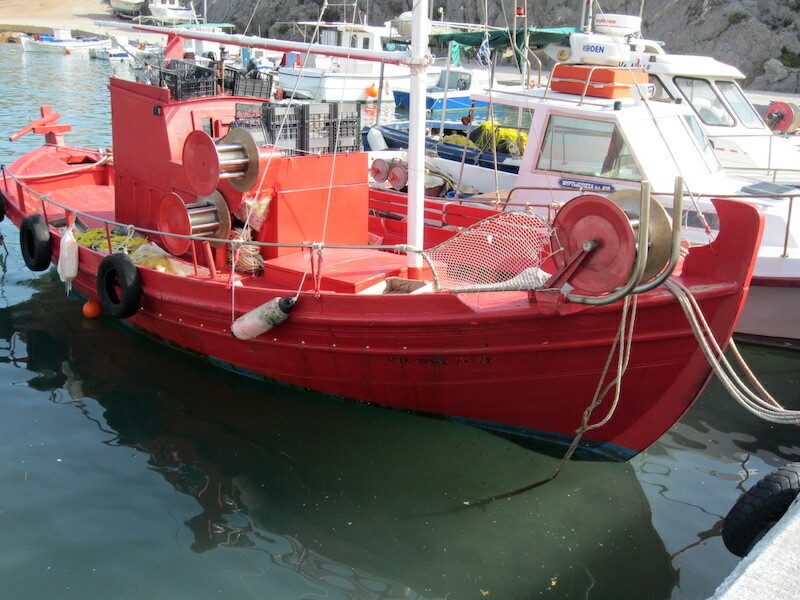 The following photographs show traditional fishing boats of Greece. Waiting for summer to come. The cylindrical drums/capstans are used to haul in nets. There was not a lot of obvious fishing activity during the time we were in Greece. We saw few fishermen with what we would call a decent catch. This set me to thinking about fish stocks in Greek waters. 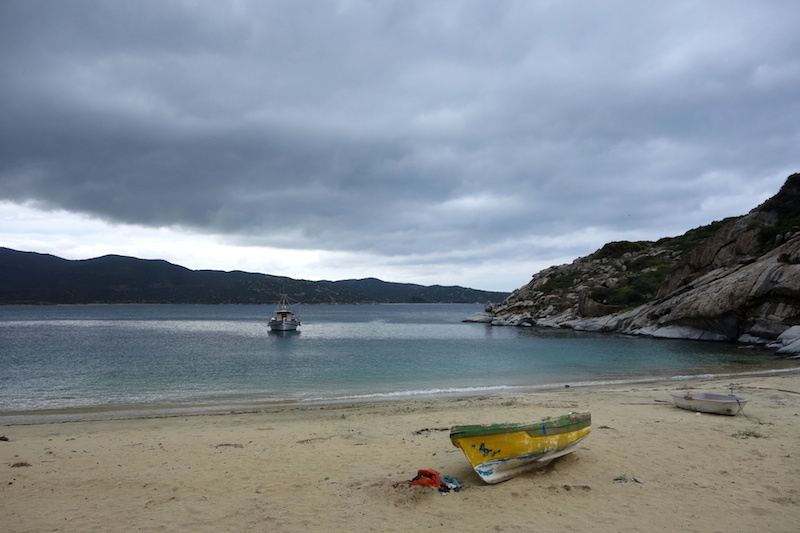 According to the World Wildlife Fund (WWF) 75% of fish species in Greek waters are being overfished to critical levels and this is not entirely the fault of local fishermen. 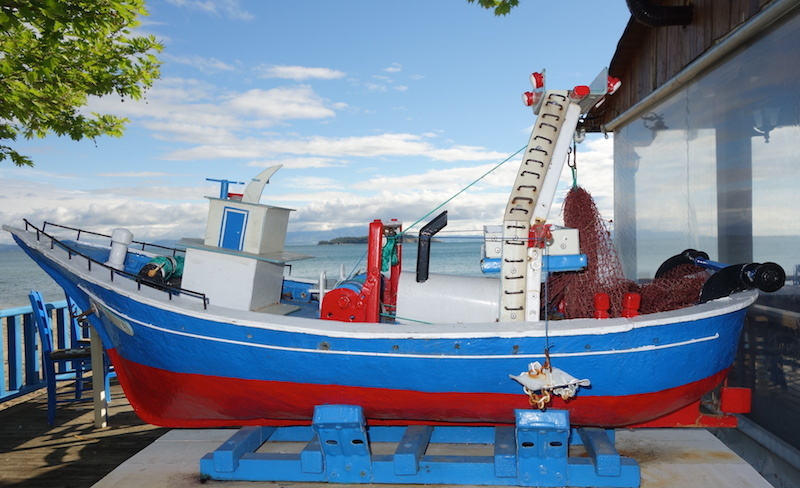 Some of the blame rests with other EU member countries who are permitted to fish in Greek waters. Traditional boats with internal ‘putt putt’ motors in Greece, like everywhere else in the world, are being replaced by outboard motors which get the fisherman further afield faster and this, combined with satellite navigation, means reefs and wrecks can be reached quickly and repeatedly pinpointed meaning individual spots are overfished. 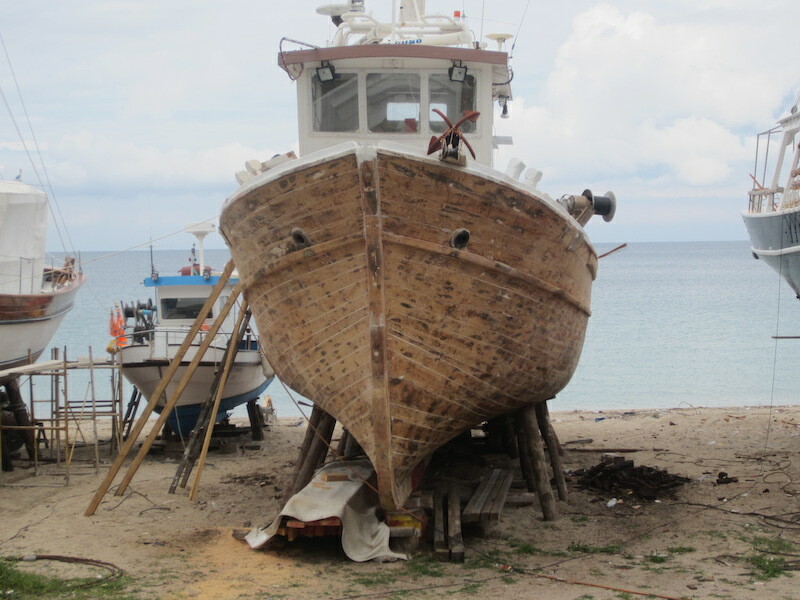 On the west side of the peninsula there is a wooden boat builders’ yard where traditional boats were being repaired and prepared for the coming summer. Carvel construction is when planks are fixed to frames with their edges butting against each other. This method of construction produces a smooth hull like the one above. Hulls like this are very strong. A frame ready for planking. 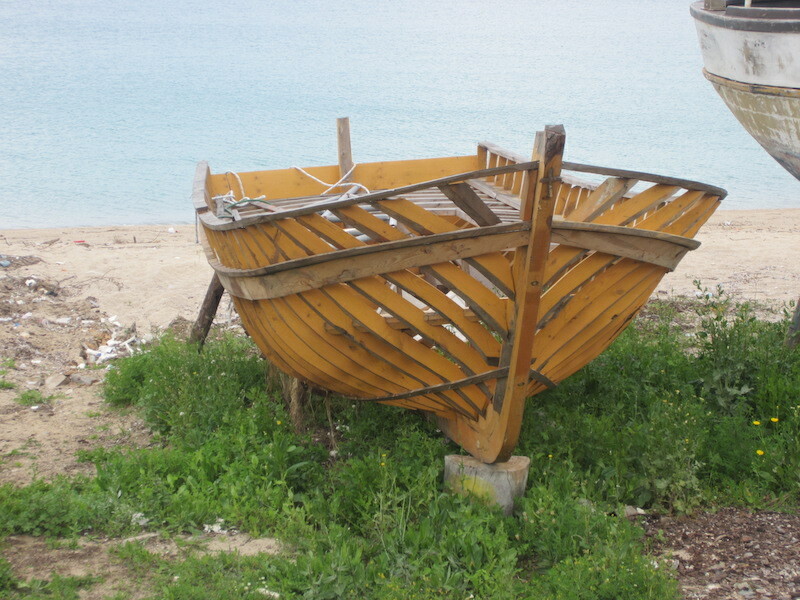 The frame of a boat is considered to be its backbone. Frames can be sawn from a slab of timber, steamed or laminated. The frames in the above craft are sawn. 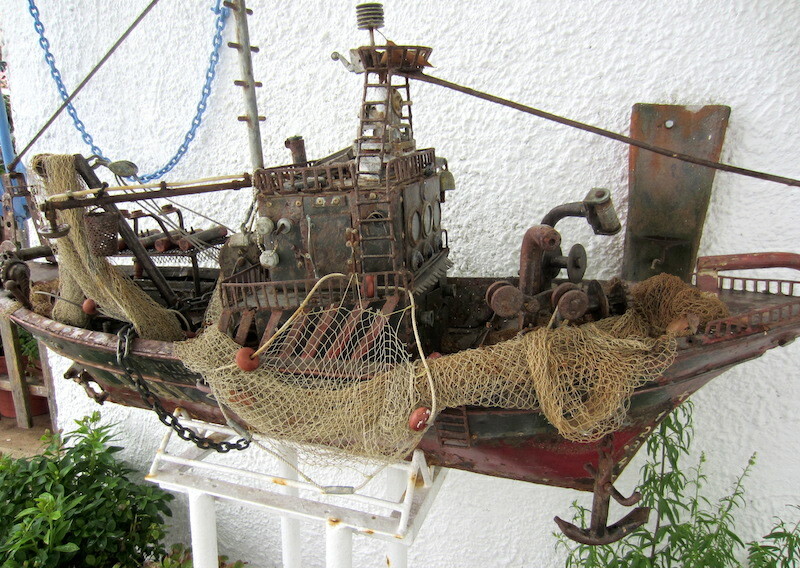 A moulded fibreglass imitation clinker-style boat. Clinker is another method of hull construction and it’s done by fixing wooden planks so that the planks overlap along their edge. 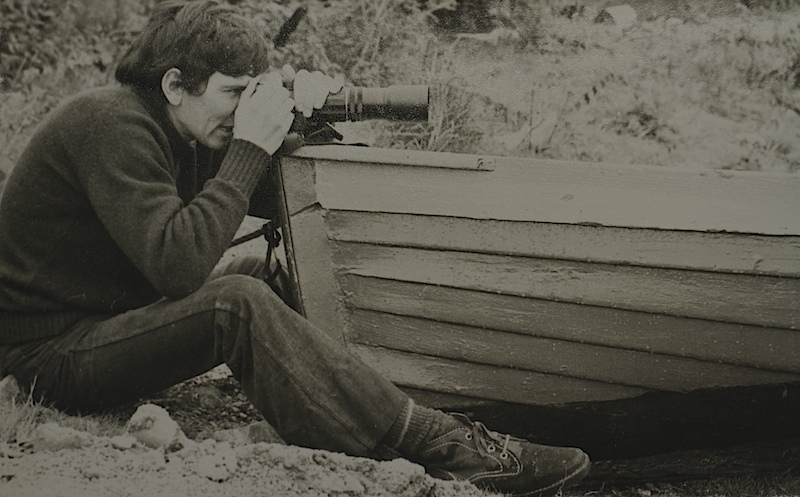 Me steadying my camera on a wooden clinker built boat in Scotland 1973. Desert boots, long hair and flares were the go in the 1970s! 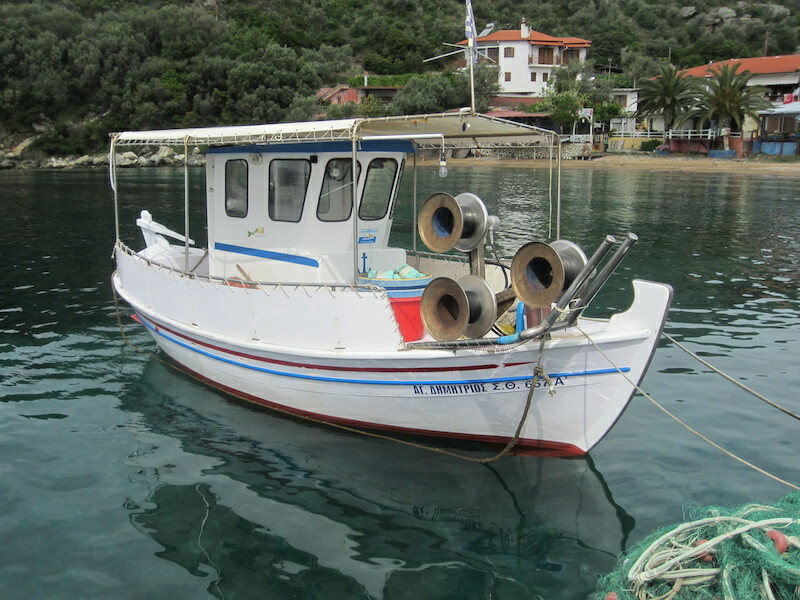 A couple of the professional fishing boats at Nikiti on the Sithonia Peninsula. Café and hotel owners when we visited were gearing up for the influx of tourists. Everybody told us they will come, from the 1st May. The best time to visit the coastal regions of Greece is from May to September, excluding August which is the peak holiday month. 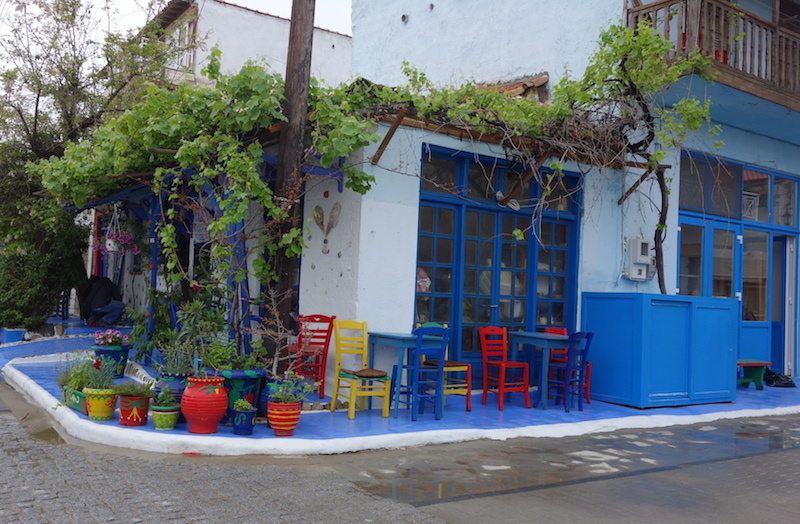 Restaurant with a fresh coat of colours for the summer. Restaurants set up tables and chairs outside for the summer. 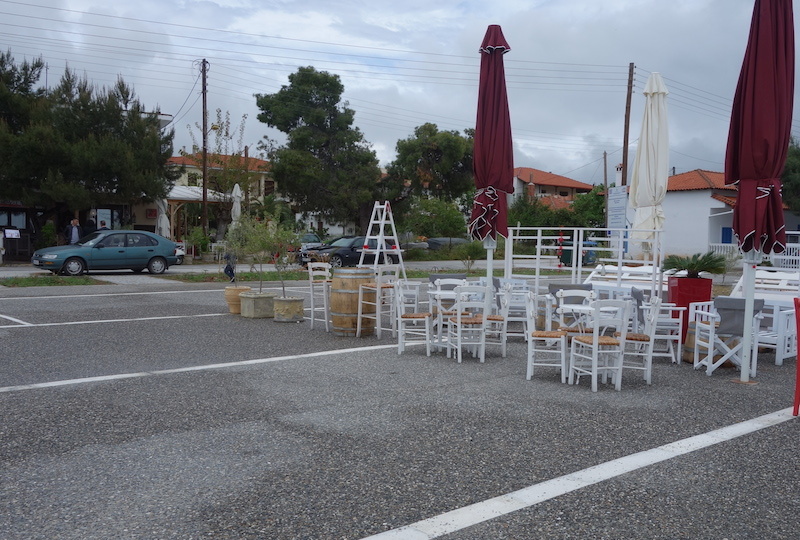 Sometimes café owners set up tables in car parks or along the edge of busy roads. Waiters run across the road dodging traffic as they deliver orders. Out of season visitors, the perfect free camp. 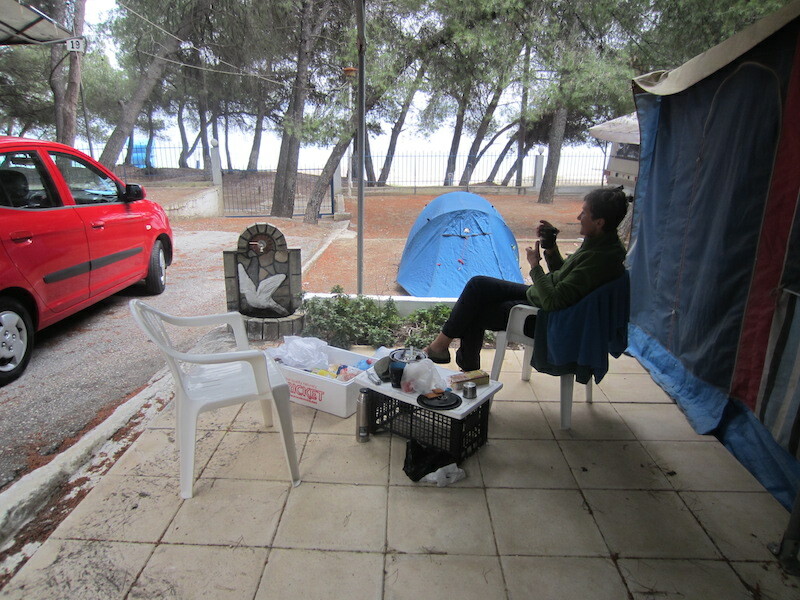 Free camping is illegal in Greece. Authorities would rather have travellers tucked up in official camping areas, not because there is a danger camping in the wild but it’s all to do with collecting taxes. Greek people have a long history of avoiding paying tax, under the counter deals on the black market are preferred. Some say this is one of the reasons why Greece is in a difficult financial state at the moment. The government is attempting to eliminate the cash economy and with some success, however I understand why many Greeks attempt to avoid paying tax. Foreign power tax collectors have exploited them for thousands of years and avoiding paying is part of their culture. Also when a government spend your tax unwisely it’s hard to keep donating. A tax accountant once said to me, ‘It’s their duty to get it and it’s my duty to make sure you don’t pay it’. Scare tactic. 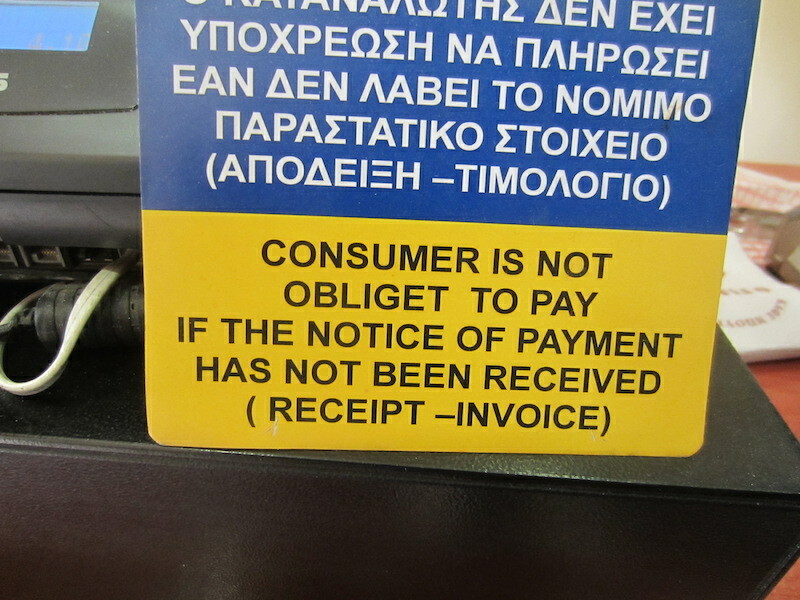 This notice appeared on many cash registers in Greece. 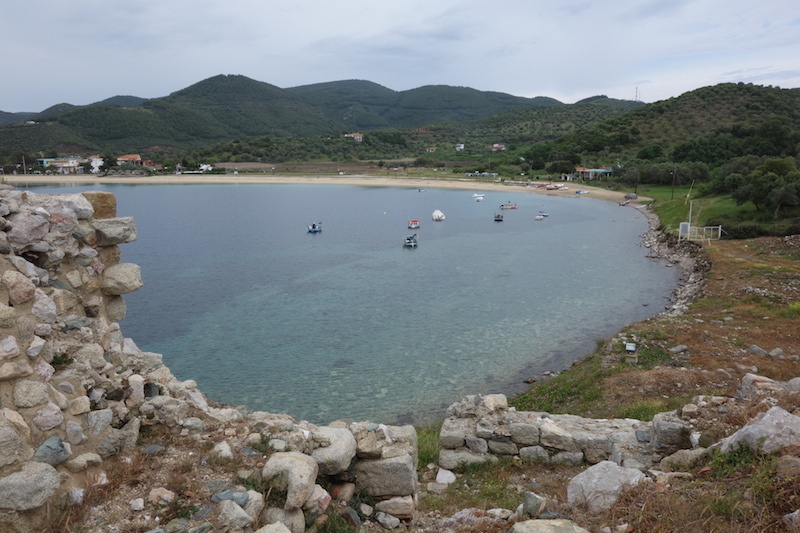 From Sithonia we headed around the coast to the third finger, Athos. 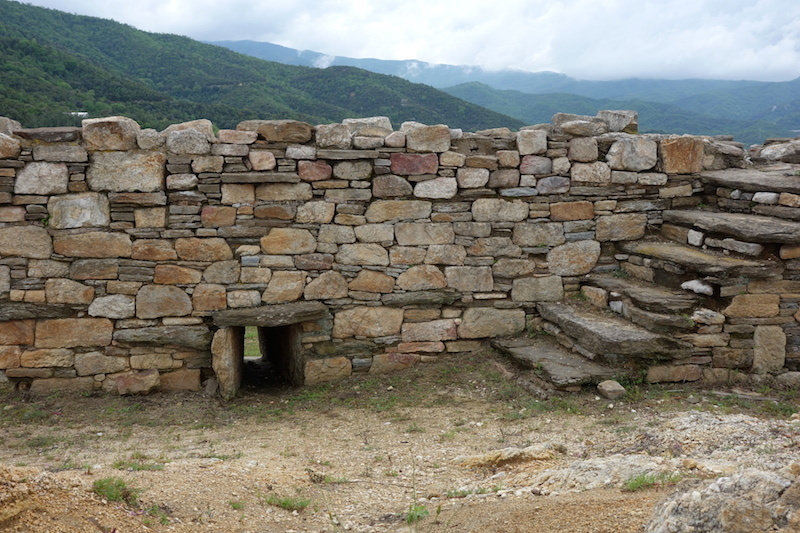 On the way we discovered the village of Pyrgadika. The atmosphere was old world and because it was early morning when we arrived the locals were trotting off to the bakery, general store and buying fish and vegetables from roving vans. Bev and I bought freshly picked broadbeans and ate them raw. Pyrgadika was one of the most appealing of all seaside villages we visited. There seemed to be a sense of community and just about everybody we passed greeted us. It would be easy to hang around there for a month or two. It was less touristy than the other towns on the three peninsulas. Supermarket in Pyrgadika. The ute in this photo is what we call a ‘bomb’. It was severely rusted. A ute is a term for utility. 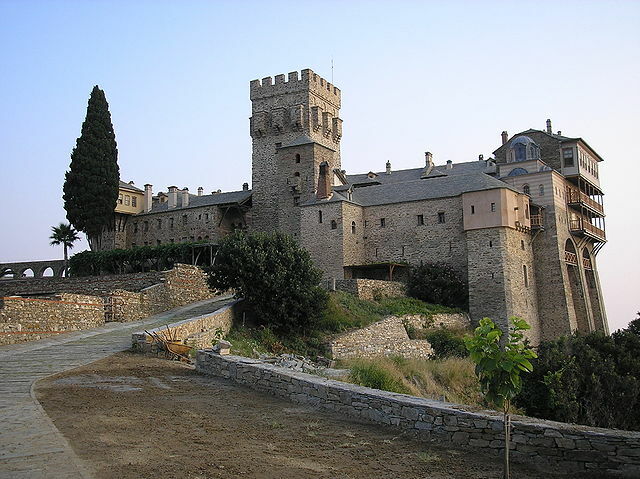 Our next stop was the third finger, the peninsula of Athos, home to twenty monasteries. The main aim for the day was to become informed about the Holy Mount Athos, the monasteries and why only males can visit there. Following are a few facts. 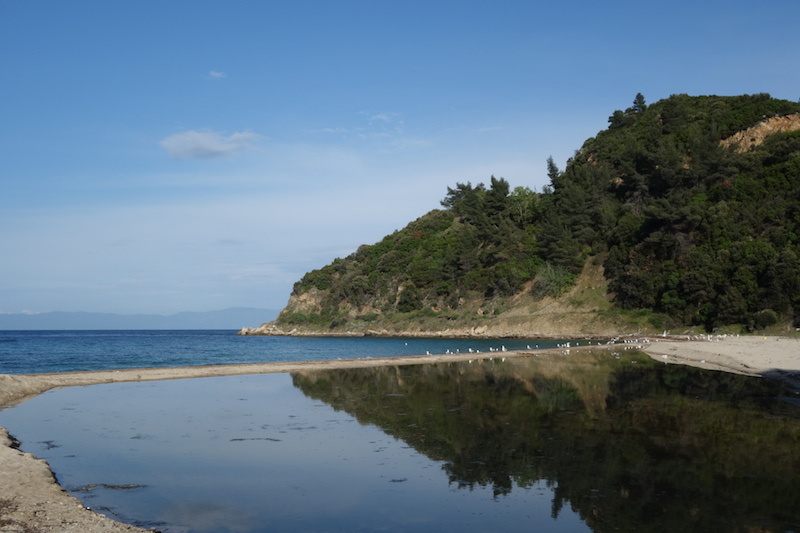 The number of daily visitors to Mount Athos is restricted and all are required to obtain a special entrance permit valid for a limited period. Only males are permitted to visit the territory, which is called the “Garden of the Virgin”. 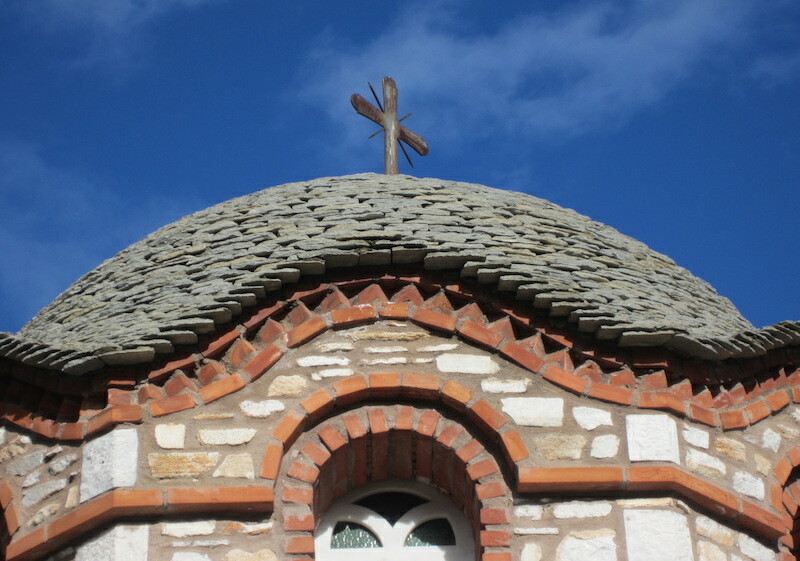 Orthodox Christians take precedence in permit issuance procedures. Visitors and those living on the peninsula must be males and members of the Eastern Orthodox Church. The prohibition on entry for women is to enable those living in celibacy to reach spiritual enlightenment more quickly. It is felt the presence of women would alter the social dynamics of the community significantly and distract monks attempting to obtain this enlightenment. The probation of women goes back to biblical times and it relates to the Blessed Virgin Mary. The B.V.M. was sailing from Israel to Cyprus accompanied by St John when their ship was blown off course to the then pagan Athos. After anchoring off shore the Virgin Mary took shore leave and was overwhelmed by the wild natural beauty of the mountain. She blessed it and as she did a voice was heard to say, ‘Let this place be your inheritance and your garden, a paradise and a haven of salvation for those seeking to be saved’. From that moment the mountain was know as the garden of the Mother of God and was out of bounds to all women. And here she is, the Blessed Virgin Mary with Jesus. Not only are women excluded from the peninsula but all female animals as well, although female cats are permitted as the population of cats needs to be maintained to keep rodents under control, especially the female ones. The lawmakers conceded that female songbirds and insects be allowed to remain, purely because it is impossible to keep them out. It’s unclear exactly how plausible the danger of a chicken, sow or cow could outshine the Virgin Mary but that’s how the law stands. A number of women have illegally gained access but were soon banished. However during the Greek civil war some women, children and men were cared for by monks. In 2008 Ukrainian smugglers dropped four Moldovan women on the coast of Athos but they were quickly apprehended by monks and police. Not a good entry point into Greece for a woman. There are moves in the EU parliament that may force Athos to admit women, having declared that the republic ‘violates the universally recognised principle of gender equality’. Today there is a thriving tourist industry revolving around the Holy Athos Republic. 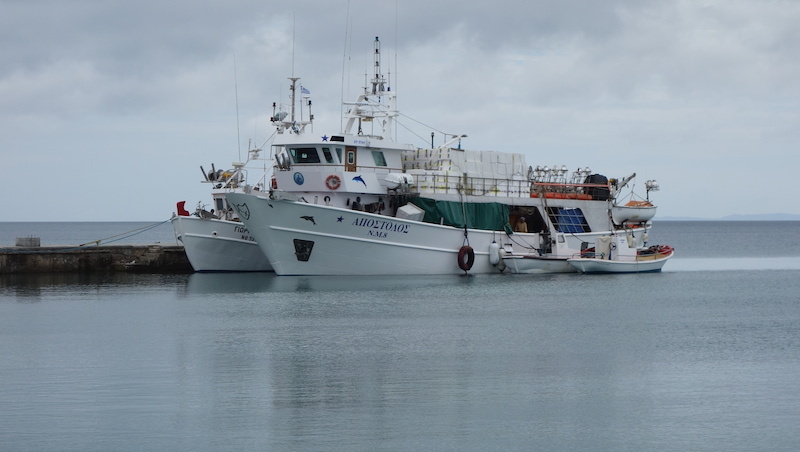 Ferries take sightseers around the peninsula. It was raining heavily the day we were there so we didn’t take a ferry ride and as a result I have had to rely on photos from other sources to show you what Mother of God country looks like. 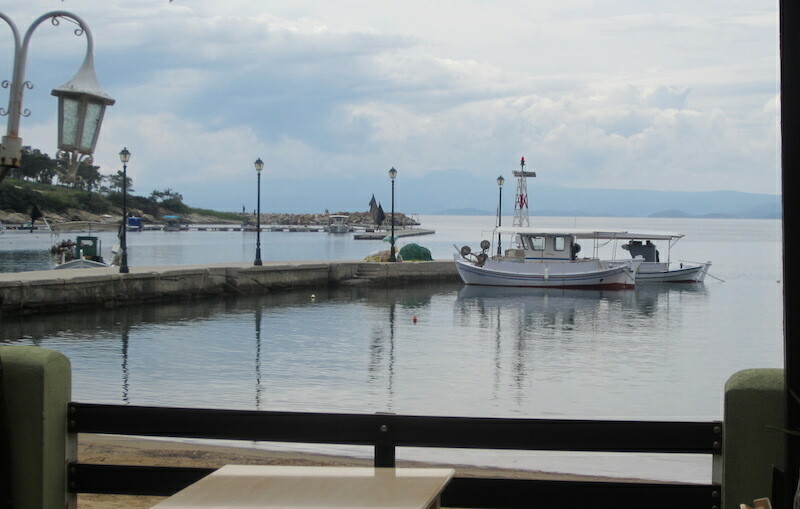 Port of Dafni, the main port on the Athos peninsula for the monasteries. Image work of Anton Lefterov via Wikimedia free media repository. From Wikipedia. Original uploader was Michalis Famelis. Image by Theodoris Lakiotis via Wiki Media with GNU Free Documentation Licence. As would be expected there are many stories relating to Holy Mount Athos. One relates to the fact that during WW2 the monks were more than willing to embrace Nazism, with good reason as Stalin was busy confiscating the Russian Orthodox church’s property and deporting its priests to the gulag. According to a Time Magazine report from 1941, the remarkably naive monks only knew of Hitler as a great German king who slayed the Bolsheviks and the Jews, a fulfilment of their prophecy. 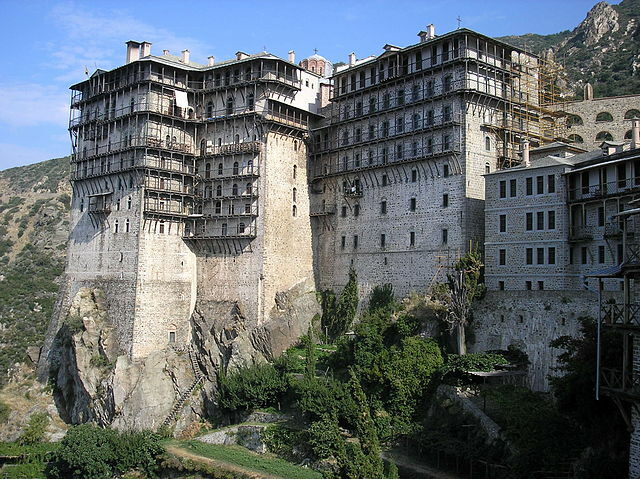 Beyond human ken is all that I can say about the past and present activities of the Holy Mt Athos monasteries. I think I had better move on before I get into a heavy religious theological argument. Day’s end found us in the village of Olympiada, up the coast from Athos. We took a room in a hotel as rain was predicted. Olympiada’s claim to fame is that in a fortress nearby was where Aristotle the Greek philosopher (384-322 BC) was born. 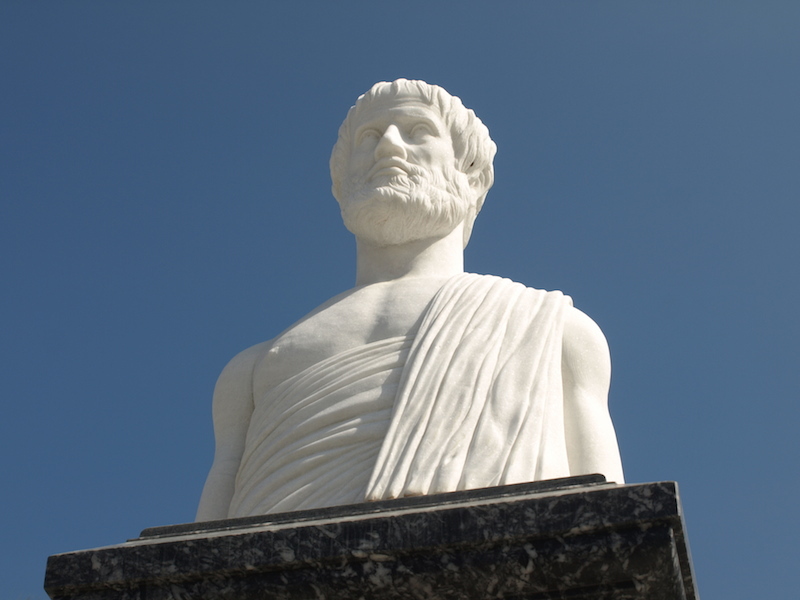 Aristotle’s studies and writings covered many subjects, including physics, biology, zoology, metaphysics, logic, ethics, aesthetics, poetry, theatre, music, rhetoric, linguistics and politics, a pretty smart dude all round. His writings and theories have influenced many present day thinkers but one of his theories that has fallen out of favour lately relates to women and their place in society. Aristotle wrote solemnly of how natural it is for a woman to lead a quiet, sedentary life, staying indoors to nurture children and preserve possessions acquired by her natural ruler, her husband. Women he said were not constituted for activities outside the home. He placed women in a class just above slave class. Aristotle. Aristotle was Alexander the Great’s tutor. The fortress where Aristotle was born is on the hill about a kilometre from the north of our lodgings, the Olympic Hotel. The fortress design and stonework was very different to what we have seen so far in both our Encountering the Past odysseys. First scratchings at the site were undertaken in 1968 and since then a number of systematic excavations have been carried out and what is now revealed delights stone wall enthusiasts such as myself. 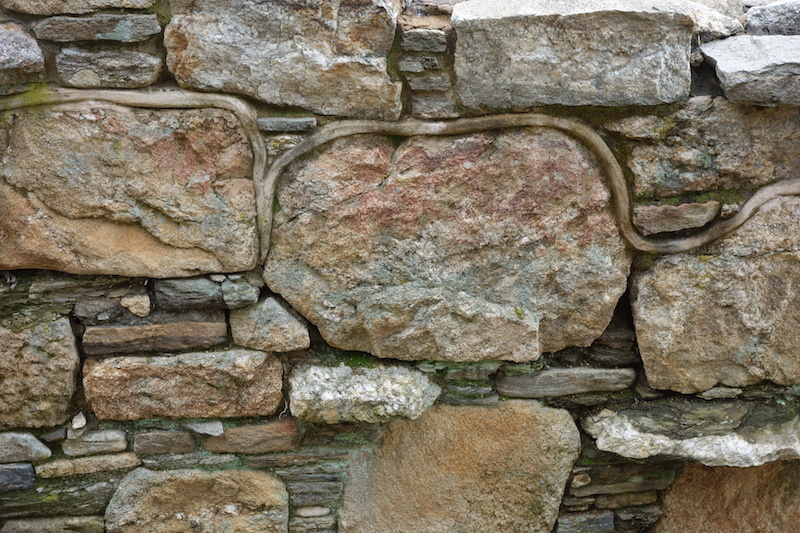 What a feature, hand hewn stones in perfect symmetry. 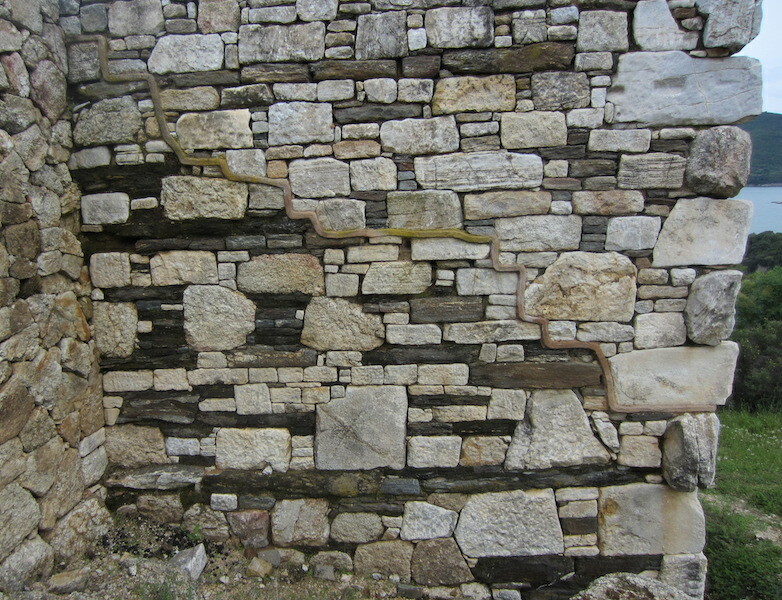 The interesting feature about the walling is the highlighted mortar line running across the wall. It is as if a damp proof course had been laid. Closeup of the mortar insert. 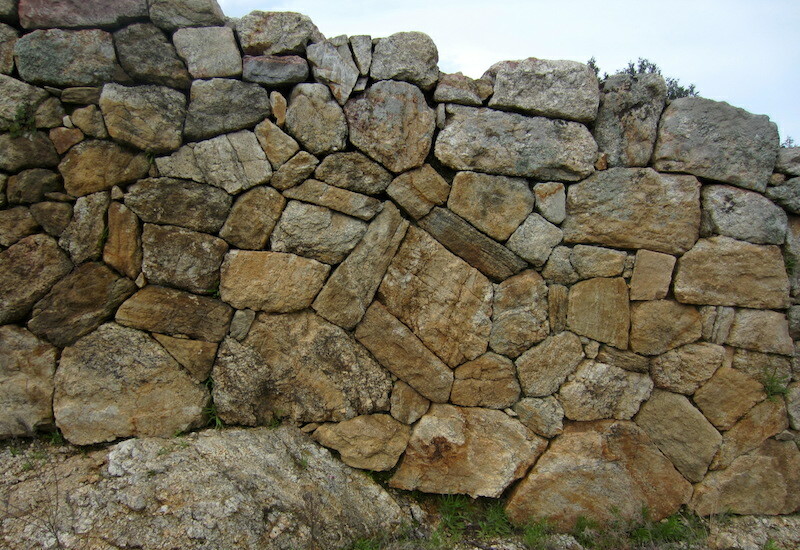 Another section of wall, angular random rubble. Rampant steps (right) and water drainage outlet near the base of steps. 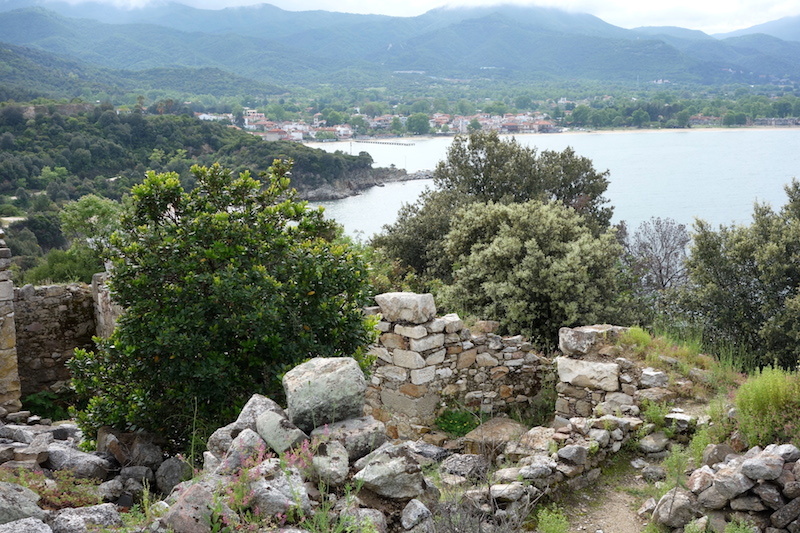 The view back towards the village of Olympiada. Our hotel is at the land end of the jetty. 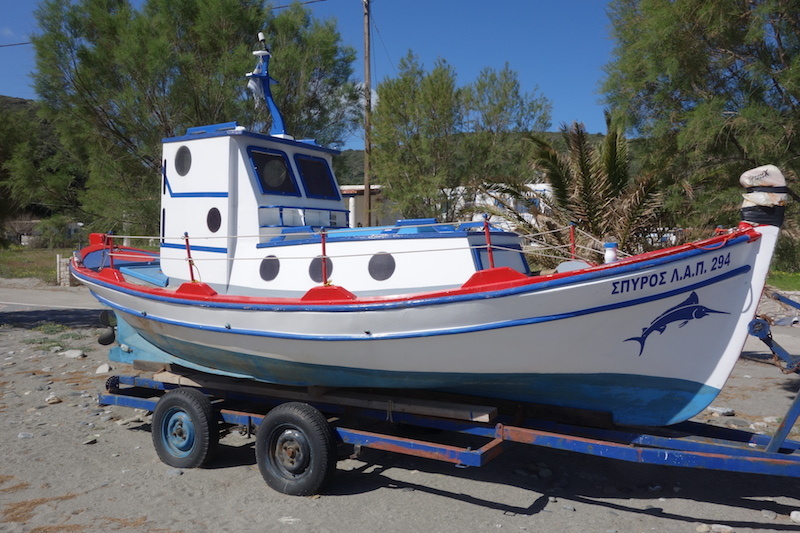 The residents of Olympiada are hooked on boats, not only functional ones but models as well. Functional boats moored to the south of the village. This model about one and a half metres long is fabricated from sheet steel. A large wooden model, a feature of an outdoor café. Another large steel fabricated model. The metal models were made from bits and pieces: bike sprockets, diesel motor injectors, gas burner jets, car instrument dials and sewing machine parts. The models were quite heavy. I know, because I helped the creator of one model lift it into position. 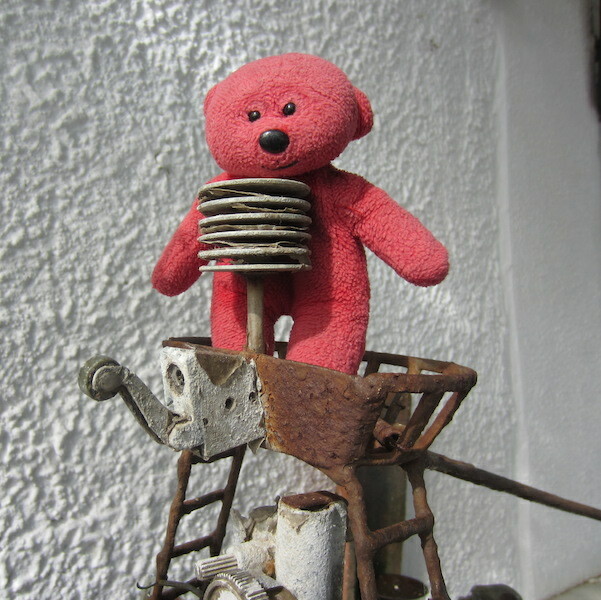 Tbear in the crow’s nest of one of the models. Following are a few of Bev’s foreshore shots. 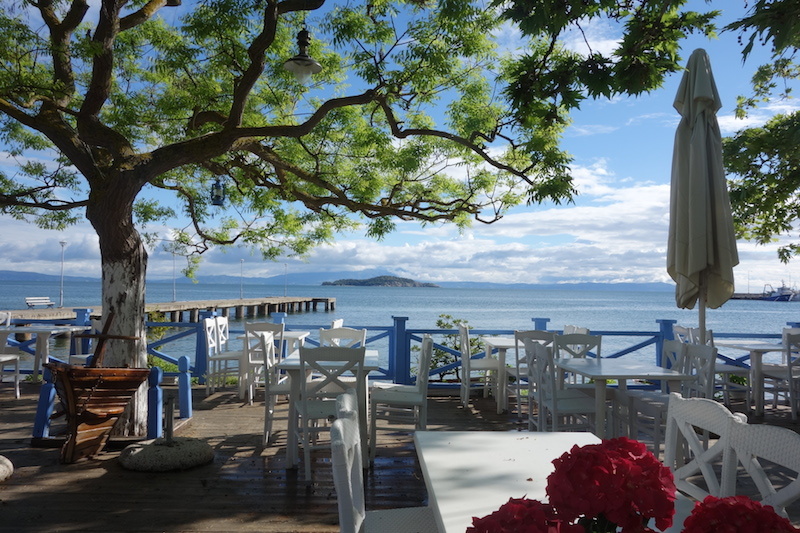 Peaceful view from a beachside restaurant. 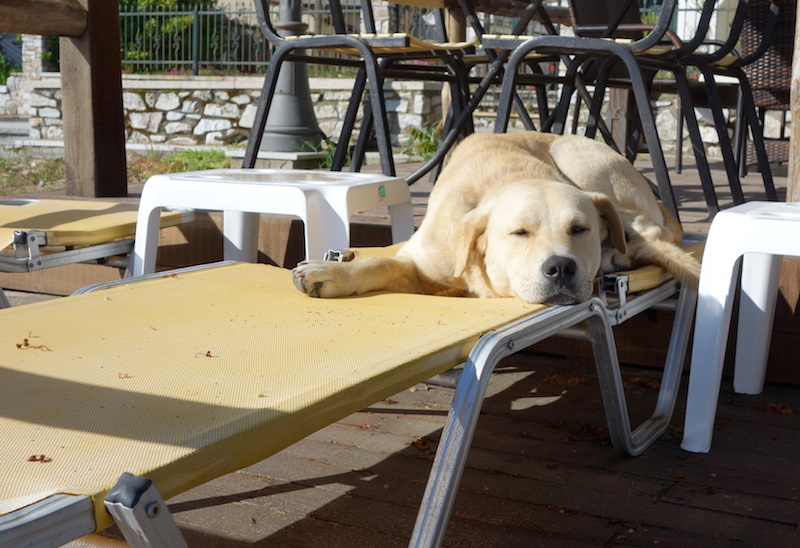 Local dog getting in some sleep on the tourists’ deck chairs before they arrive. Painting frenzy before the tourists arrive. The man straddling the ladder had the ladder connected to his feet and he simply moved position by walking. Curved lines of a church stone roof, worthy of a high commendation. After two nights in Olympiada we moved on to the east with the aim of visiting Kavala which we passed through in the1970s and we thought it might be worth a return visit. Diary entry for the 14th January 1973. 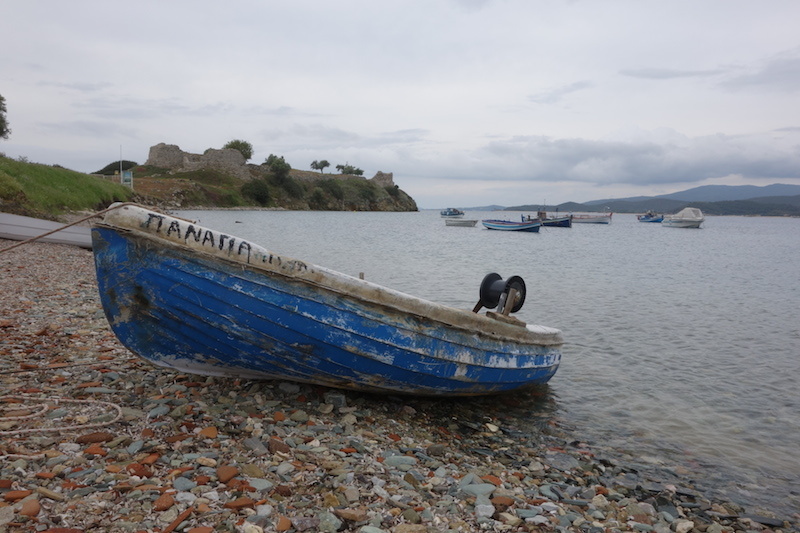 That’s the end of this post, the next one will relate to our travels to the north of Kavala towards the Bulgarian border and our ultimate return to Thessaloniki. You have done a great job my friend-,thanks! 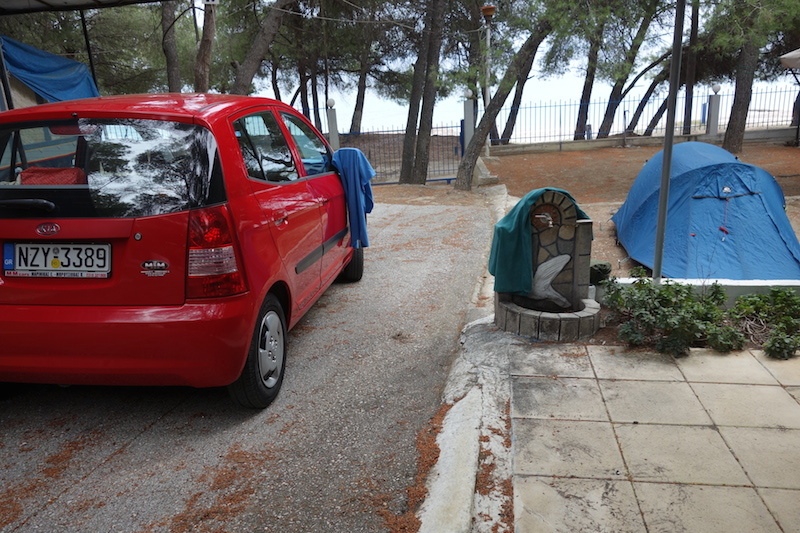 I live on the very border of Greece and have map of waypoints marked on the map of Halkidiki(Google Earth,KML or KMZ format ),about 200 spots, all of them are wild beaches of Halkidiki,mostly visited by me and 90% of them accessable by car.My rule is-car,tent and sea…must be at most 10m distance! As u can see my english is not good so maybe have any idea how to share my project? Thanks for the comment. 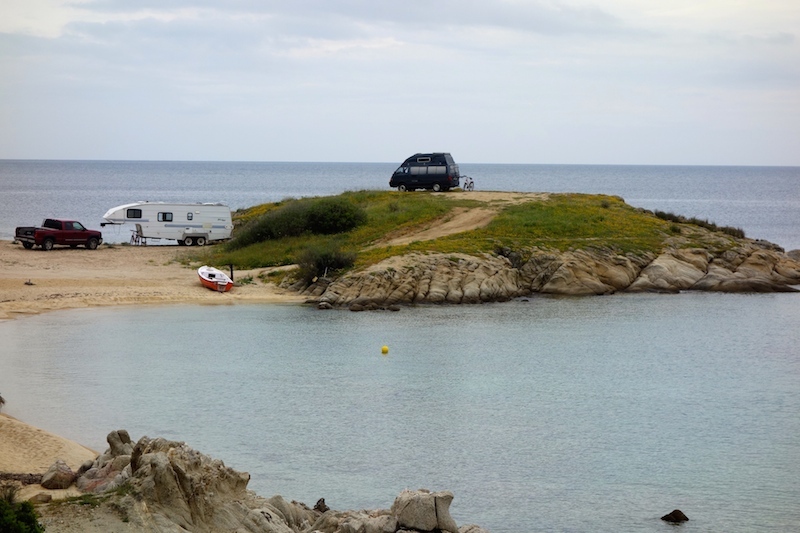 It’s interesting car, tent and sea, I’m more inclined to say kayak, tent and sea. As I get older I’m not enjoying the car so much although I know that the only way to get to some places involves the use of a car. Bev and I have done a lot of walking/kayaking in the Tasmanian South West Wilderness and much of it involved coastal regions. We returned and Encountered the Past in Tasmania in late last year and early 2017 and I intend posting our experiences in this blog very soon. Because of your interest in tent and sea I’m sure you will enjoy what is coming up. 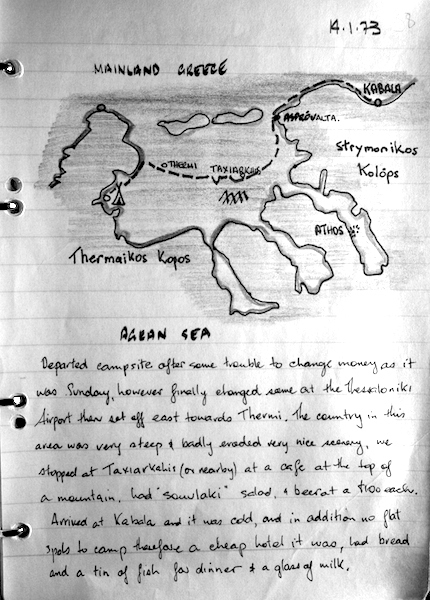 Might I suggest you search the post ‘WHY KYTHERA’ it shows a lot of rugged Greek island coastline. 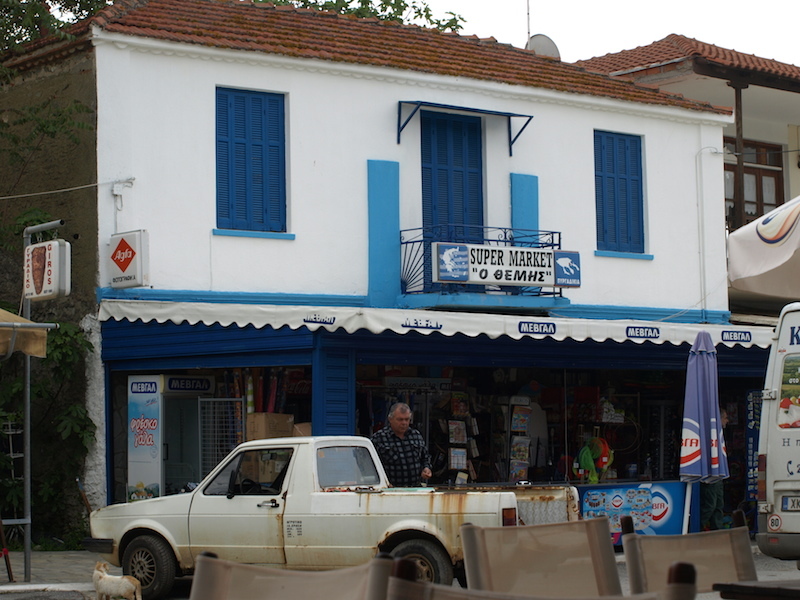 Kythera is down off the southern tip of the Peloponnese. Don’t forget click on follow and you will be alerted when I post new stories.